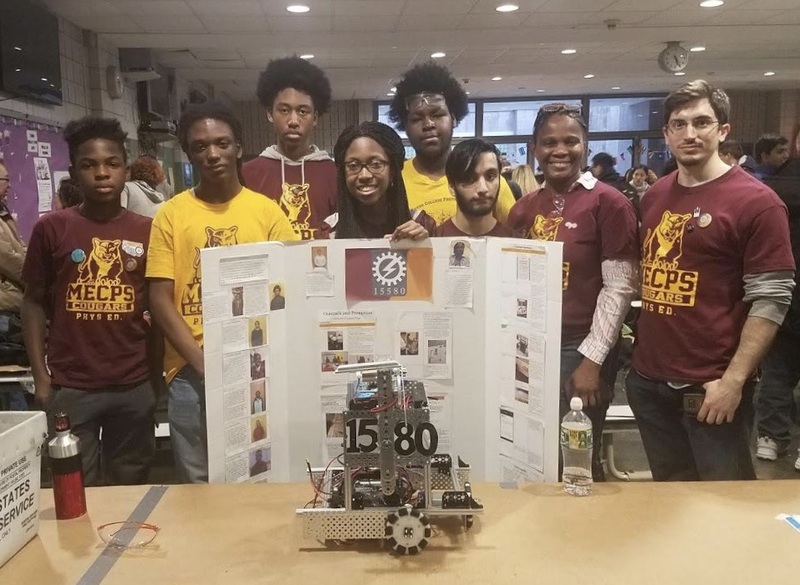 Member of the robotics team show what they can do: (from left to right) Alex Powell, Malcolm Robinson, Moses Stewart, Ashanti Benons, Jensen Andre, Ghanzafar Shahbaz, Oyo Tommy and teacher David Lado. I am passionate about innovation. In the past year, I pursued my interest in computer science and collaborated with peers, teachers, and parents to delve into a domain that I had no prior experience with or understanding of: robotics. At the beginning of my junior year at Medgar Evers College Preparatory School, I became tired of hearing about the lack of minorities and women of color in STEM (science, technology engineering and math) fields. Studies conducted by the National Society of Black Engineers and the Society of Women Engineers have found that only 4 percent of African American, Hispanic and Native American women have engineering degrees. This encouraged me to start an after-school robotics club for students interested in competing in First Tech Challenge (FTC) and First Lego League (FLL) competitions. FTC reminded me of a NASA-inspired video game, but with real world benefits such as scholarship opportunities and connections to local professionals in the engineering community. In the 2018-2019 FTC game, ROVER RUCKUS teams worked in alliance with another team to score points by descending from a lander, collecting minerals from the crater, and sorting and scoring the minerals in the cargo hold of the lander. In October, the other interested students and I knew that without motivated members, funding, transportation and a room to use after school, the club would quickly die. Our search for mentors didn’t last long. One of my friends knew that a parent, Ms. Tommy, had sacrificed her living room space to allow her son to participate in Lego competitions. Once she decided to assist our team, I asked Mr. David Lado, a physics teacher, to use his room after school. He agreed, and on the first Friday in October, we had our first meeting. The daunting task of organizing, building a robot and keeping members engaged in the club was now thrust unto my shoulders. The other co-founders and I actively sought out new members, convinced our school office to make loudspeaker announcements and posted hand-designed flyers around the building. Students curious about robotics joined the team. We started by watching videos of the competition, going over the game manuals together and reviewing specific roles that each person would play in the team. In mid-October, with funding from our school’s PTA, we purchased a starter kit from the FTC website and began the exciting and frustrating task of assembling a robot from scratch. Limited by having only two or three meetings of two to four hours a week, we made slow but steady progress. We attended our first FTC qualifier on Dec. 8. Winning the Connect Award at the New York City competition propelled us forward as we anticipated the super qualifier on Feb.16, 2019. Despite our lack of experience, money and financial aid, our team was able to win two awards throughout our season and qualify for the NYC Championship at Townsend Harris High School on March 10. At that championship, we faced major difficulties with our robot’s motion and some last minute design changes we made ended up backfiring, making it nearly impossible to score points. Despite this, we won second place in the Connect Award, another indicator that our team can thrive if we continue to push for more funding and create a plan to recruit more members for next year. Our focus this semester has been encouraging enough students to vote in a participatory budget funding event for a few thousand dollars to maintain the team for the 2019-2020 school year. We also will work on expanding interest in mechanical engineering to the entire school by partnering with New York Edge, a program that engages middle school students. The only way to encourage more students to pursue engineering careers is to introduce the field to them at a young age, as this critical time period shapes our interests. Through our partnership with New York Edge, middle school students will be able to learn how to build and program robots to enter in competitions. Seventh and eighth grade students will also be able to join our team, helping to ensure its survival. Ashanti Benons is a junior at Medgar Evers College Preparatory School in Crown Heights, an academically advanced school for students in grades 6 through 12.